Chinese President Xi Jinping, right, and British Prime Minister Theresa May gesture ahead a meeting at the Diaoyutai State Guesthouse in Beijing (Feb. 1, 2018). This month, the United Kingdom and China should be celebrating a milestone in their modern relations by holding the 10th anniversary U.K.-China Economic and Financial Dialogue (EFD), an annual meeting designed to facilitate bilateral trade and investment ties and intensify their diplomatic relations. Ironically, perhaps, the political maelstrom in the U.K. caused by Brexit means that an event designed to promote “Global Britain” is being quietly delayed for an unknown period of time. What has happened to that grand, ambitious vision? And what does the U.K.’s possible exit from the European Union auger for the future? Simply put, that still-confidently articulated vision of a Golden Era of U.K.-China relations has never materialized as it was envisioned. For three reasons, it almost certainly never will. The Golden Era was always China’s, and the U.K. is a marginal player. Ultimately, the U.K. does not really matter much to China. As a trade partner, Britain ranks below Australia, Vietnam, South Korea, Malaysia, and others. France formulated visions of a “global strategic partnership” with China as far back as 2004. Germany, China’s most important economic partner in Europe by far, exports four times as much to China as the U.K. and imports twice as much. Berlin also has a “special relationship” of its own with Beijing, with China recognizing Germany as the political and economic hub of an EU it covets as a key market for exports and investment. The U.K. offers valued specialisms to China in banking and finance, experience in international bureaucracy, and security services. It is also a key destination for Chinese students abroad. The hard truth remains, however, that the U.K. is a tertiary-level partner for China, behind far more profitable and consequential (mainly Asia-Pacific) others. The British-formulated notion of a Golden Era of U.K.-China relations has always to a significant extent been purposefully hollow to make it difficult to disprove. It is formally endorsed by Beijing, mainly because it does no harm. It can soften up a British public who may be wary of accepting increasing levels of Chinese influence and investment, serving Beijing’s “soft power” interests by working to improve its image abroad. In 2017 China’s ambassador to the U.K. was happy to reemphasize the Golden Era to promote the visit of Chinese warships to London. It also supports policy goals; in 2015 the U.K. resisted lobbying from Washington to become the first major Western economy to agree to join the Chinese-led Asian Infrastructure Investment Bank, prompting others to follow. The U.K., however, has long been one among a crowd of foreign (not least European) nations — especially in the post-crash era of 2007 to 2008 — who have vied for Chinese economic attention. The U.K. is at the same time one of many special partners of China, and no special partner at all. The U.K.’s targets for the Golden Era have not been met. In 2012 the U.K. Foreign Office asserted that it had increased its China staff network by 60 percent and that the target was to double trade with China by 2015. As I outline in a recent academic article, between 2010 and 2015 U.K. trade with China increased by around 30 percent. The aims of the Golden Era seemed to (at least partly) be paying off. However, in the five-year period beforehand, between 2005 and 2010, when there existed less political emphasis on China, trade had increased by more than 130 percent. Two-way investment remained strong after 2010, but in the grand scheme of things there is very little evidence that the Golden Era has even come close to achieving its primary goals of boosting the U.K.-China economic relationship. The relationship, moreover, is no more immune than before to sudden diplomatic setbacks; Beijing denounced a 2012 meeting between Cameron and the Dalai Lama by cancelling official meetings and forcing Whitehall to retreat from the issue. 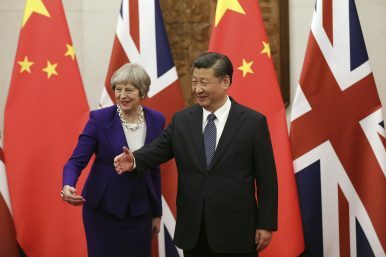 When Theresa May delayed a decision on construction of the Hinkley Point nuclear power station, which had attracted significant Chinese investment, after becoming prime minister in 2016, Beijing warned it could damage “mutual trust” between the two nations. Beijing has made little secret of the fact that it has lost some enthusiasm for its relationship with the U.K. under the May government, illustrated by her low-key reception in China on her last visit there in February 2018. The Golden Era was not designed to accommodate Brexit. Prior to the U.K.’s Brexit referendum in June 2016, Beijing expressed a preference that it remain in the EU, with Britain’s access to the European single market a traditional draw for Chinese (and wider Asian, notably Japanese) investment. The forced postponement of this year’s EFD will confirm suspicions in China that the U.K., rather than standing at the cusp of a future as Global Britain, is already mired in a local quagmire of its own making, and will be for the foreseeable future. If the U.K. leaves the EU as scheduled in March 2019, its relationship with China will be reformulated. To what extent depends largely upon the type of exit the U.K. makes. A “soft” Brexit will be least disruptive, with the U.K. likely retaining access to the EU Single Market and Customs Union. In this scenario the core material foundations of the Golden Era would be retained, including its lofty (and largely unrealized) rhetoric. The U.K. would also remain part of protracted but ongoing EU-China free trade talks. A “hard” Brexit, by which the U.K. leaves the Single Market and Customs Union, would be more disruptive. With heavily diminished economic and political access to, and influence in, Europe, a post-Brexit U.K. would need to convince China of what else it brings to the table. If trade potential were to represent the U.K.’s hand, it would be a weak one; Britain currently takes less than 3 percent of Chinese exports and sends less than 2 percent of China’s imports. Beijing would have the time and resources to push hard for concessions from a smaller partner keen to sign deals quickly; these could feasibly include opening up critical British infrastructure such as energy or telecoms to more Chinese investment, or securing diplomatic support on internationally sensitive issues and projects. Some in China already see opportunities in a post-Brexit Britain, which should be a cause for caution as much as celebration in the U.K..
China’s leadership will not be too perturbed by the postponement of this year’s EFD. Beijing’s priority is resolving its trade war with the United States, and in many ways the delay will complement the Chinese leadership’s “wait and see” approach to the Brexit process. In its absence, the relationship will continue as normal on what is a relatively healthy footing. Britain is a valuable, if distant, European partner with key specialisms and forms of influence China is keen to utilize; China is a world power the U.K. increasingly courts, principally for economic gain. Beyond there, it is unrealistic to expect the U.K. to become China’s “best partner in the West,” and China does not actively seek one such partner. In any case, the costs to the U.K. of definitely securing such a position, not least after Brexit, would be problematically — perhaps unacceptably — high, both economically and politically.